As mother (Kirsten) and daughter (Emma) we have been working on informal art projects for many years. In 2013 we decided to create a truly collaborative photographic series. This project was realized after two trips to Iceland together. Emma Powell is an Assistant Professor of Art at Colorado College, where she teaches, photography, and design. Powell graduated from the College of Wooster, and received her MFA in photography from Rochester Institute of Technology. 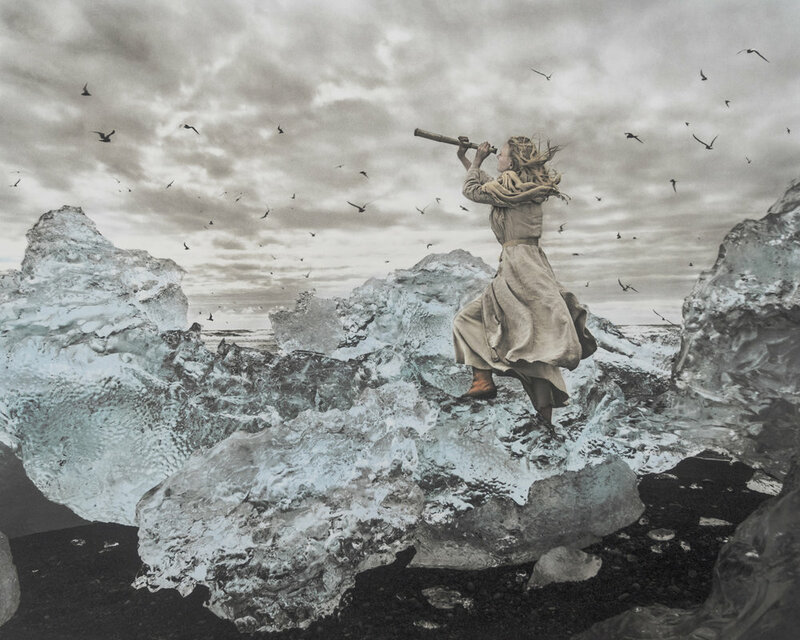 Her work often utilizes historic photographic processes to illustrate fictional narratives. 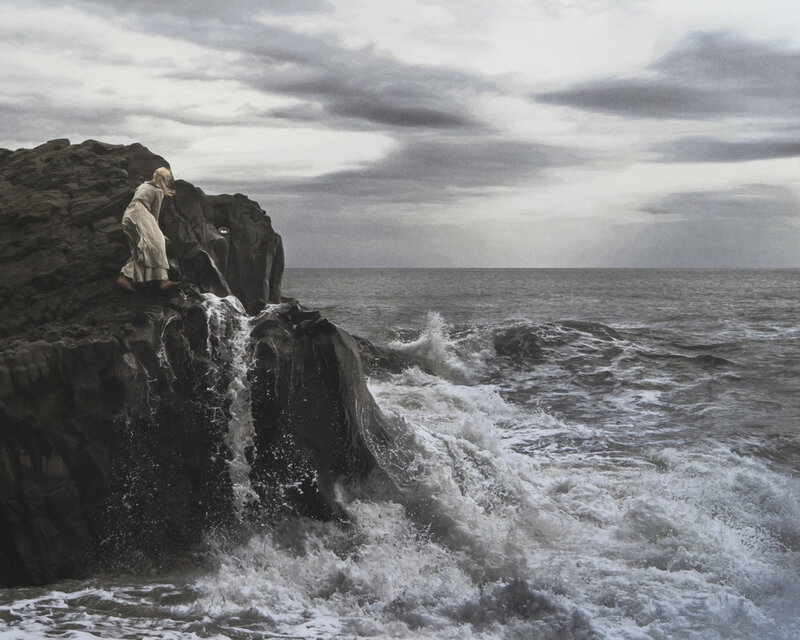 Kirsten Hoving is a Charles A. Dana Professory of Art History at Middlebury College. Twelve years ago, she took her first photography workshop to help her be a better scholar and teacher of photographic history and she was hooked. In between writing books and articles and teaching courses about modern art and the history of photography at Middlebury College, she makes photographs. Hoving co-founded PhotoPlace Gallery. 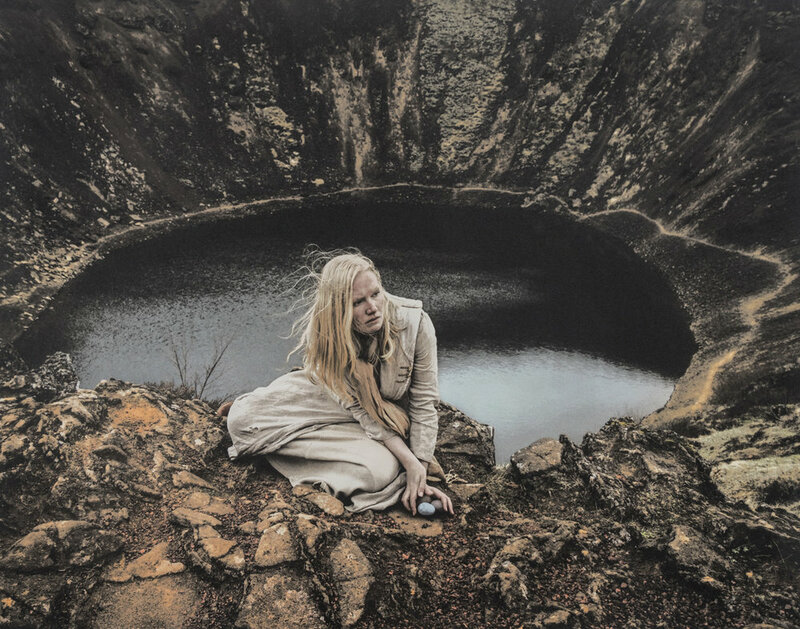 Svala’s Saga is a photographic fairy tale about the journey of a single character and the world she inhabits. As told through fifty interrelated photographs, our strong female heroine, Svala, is confronted with the sudden loss of the world’s birds. She then embarks on a mythic quest: as the Earth heats and cools, she journeys through the wilderness searching for the last remaining eggs. Svala’s Saga harnesses the power of fiction to explore topics such as climate change and species extinction. 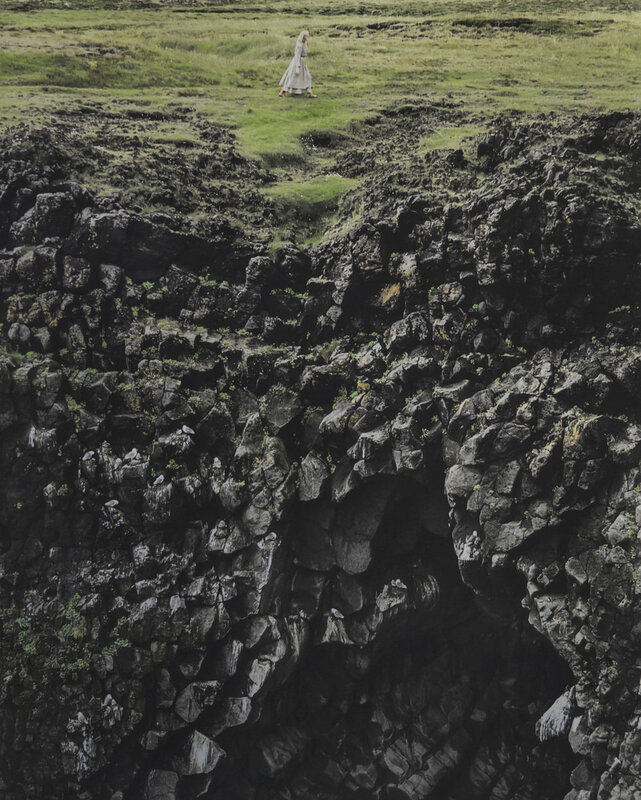 The landscape of Iceland is an active character in the narrative. Svala interacts dramatically with a variety of visually astonishing rock formations, steam vents, glaciers, and geysers. 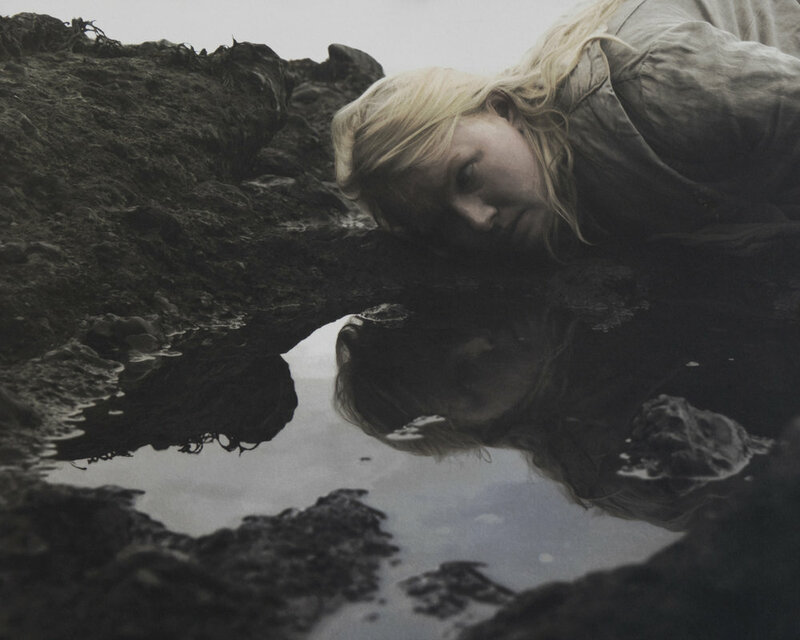 In this realm of environmental extremes, Svala’s story abounds with magic and metaphor. Svala’s Saga is printed using the historic palladium process coated over a digital/pigment under-print, a process that has been called “Pigment over Palladium.” This hybrid technique evokes hand-colored photographs or painted illustrations, reinforcing the combination of fantasy and photography. Colorado College is a small private liberal arts college. One very unique aspect of Colorado College is the block plan. Each class is three and a half weeks long. This means students work in one intensive class at a time, meeting every day and moving through material very quickly. Colorado College offers a BA degree. The art department is made up of both Studio Art and Art History. We have a black and white darkroom as well as multiple digital classrooms. During classes cameras and other photographic equiptment are provided for students to check out. The studio art program also includes printmaking, painting, and sculpture. Ceramics and Fiber arts are offered through the Arts & Crafts extracurricular program. Next door is the highly regarded art museum The Colorado Springs Fine Art Center at Colorado College. I teach all the photography courses, intro darkroom, advanced photography, and special topics courses such as "Photography and the Environment" or "Photography and Innovation". I also teach studio art design foundations and senior thesis seminar. I teach a range of photographic processes starting with cyanotype in my studio art foundations courses. I highly encourage students to use technology to bridge the gap between darkroom and digital processes. Though the processes I choose to teach in the upper-level classes change year to year, I have taught alternative processes such as pinhole cameras, van dyke brown, and wet plate collodion. Students are required to make darkroom or digital prints depending on the course assignments. Photographic digital printers are available during the class. Printers are availble outside of class for proposed acedemic projects. We also have a campus printing facility where students can order digital prints. Studio art classes at Colorado College all have regular criitques. The style will depend on the course, assignment, and professor. Studio art classes normally include 10-16 students, each student is expected to create orginal work and participate in the critique process. Critiques are normally only open to the students in the course. We reguarly have visiting artists who offer indiviudal critiques or portfolio reviews, these are most often arranged as part of the senior thesis program. Visiting artists often run in-class workshops.